Over the last 18 months the team behind the Microbiome Movement Series have continued to work closely with C-Level Executives, VP’s and Directors from pharma and biotech to understand the key challenges in translating the Microbiome R&D into safe, effective & commercially therapeutics. 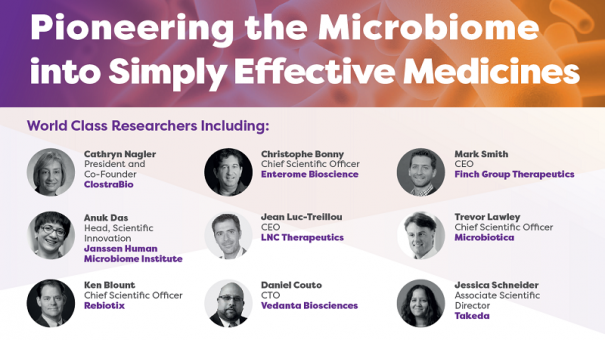 As numerous companies push to have the first microbiome-based therapeutic with market approval, there are still major challenges and nuances in this field when analyzing pre-clinical data, translating that into the clinic, as well as building an effective CMC/manufacturing strategy that allows a realistic scale-up, and navigating the regulatory landscape which has become increasingly difficult for new organizations with novel and breakthrough modalities. To help pharmaceutical and biotech organizations build a robust drug development protocol, the 3rd Annual Microbiome Drug Development Summit remains the world’s only case study driven, end-to-end meeting which focuses exclusively on the discovery, development and commercialization of microbiome-based therapeutics; making it the industry-leading forum for drug developers. Take a look at the finalized program and speakers here.